As well as read more about the song's meaning. Parallel Lives drops June 3rd, we're getting really excited! Head over to Noisey to hear "Habit," a first taste of our second full-length album, Parallel Lives, which will be released on June 3rd, 2016. The song is accompanied by a video, edited by the lovely Greg Mitchels, showing you a bit of what we've been up to the past two years. Preorders are live for the album HERE. We again put a lot of time and effort into each package and variant, including a limited 180g vinyl record with a custom slipcover. Preordering gets you an instant download of "Habit." You can read a bit about the album HERE. We've honestly never been more proud of anything we've done and couldn't be happier to finally share at least a piece of this project with you. Today we're premiering our song "Captive" over at A.V. Club. Click the image to check it out! The release is through Overdue Collection Agency, who is celebrating its new status as a 501(c)(3) charitable organization. The split between us and Matt Pryor is titled Burn Bright Vol. 1, and will be the first release of original material from the label. In addition, 50% of the profits from this release will benefit charitable organizations that support survivors of sexual assault, The East Los Angeles Women’s Center and RAINN. “Captive” was one of our favorite songs from the Bloom & Breathe recording sessions, and we thought it stood so well on it’s own that we ultimately decided to leave it off the album to present in another project. When Michael from Overdue Collection reached out about doing a charity split with Matt Pryor, we knew it was the right placement for the track. In addition to working with a label dedicated to quality vinyl releases, we’re proud to be supporting charities focused on survivors of sexual assault with a portion of the profits for this release. This cause is extremely important and we urge you to look into these organizations and donate further in any way you can. Additionally, Matt Pryor has contributed two tracks, “My Own Reflection” and “Brake Lines,” to Burn Bright Vol. 1. His latest release is the live album Nine Forty Live, and fans can catch him in concert with Chris Conley and Andy Jackson on the tail end of his current tour. Burn Bright Vol. 1 will be available in 5 vinyl variants in total. 3 are exclusive to Overdue Collection Agency’swebstore. Gates and Pryor have their own unique versions, which will be available on their respective tours. There's a lyrical easter egg in the track for fans of You Are All You Have Left to Fear. Hope you enjoy! The past few days have been amazing. Our first time in Minnesota was at the Triple Rock in Minneapolis. We got to hangout and meet so many great people, we were introduced to Nic from New Vintage Amplifiers and talked about potential custom gear orders for our next record. We also got to see our buddy Tyler Habeck who we haven't seen since our first full US Tour which he tour managed Tiny Moving Parts for. We can't wait to come back through the area! Today we are headed out to Colorado to play the Marquis Theater in Denver. Our stay in Colorado will last a few days, we have a day off the in Boulder area tomorrow so we are planning on exploring and drinking in the wilderness. Last night we played at the Demo in St Louis for the second time. We had the chance to catch up with our buddies in Foxing while we were in town. It was great seeing them for the first time since our winter tour with them. We traded some demos of new material and Eric was kind enough to take us to the zoo on our day off. Tonight we'll be back at the Subterranean in Chicago. So stoked to be able to play Chicago again with Pianos! 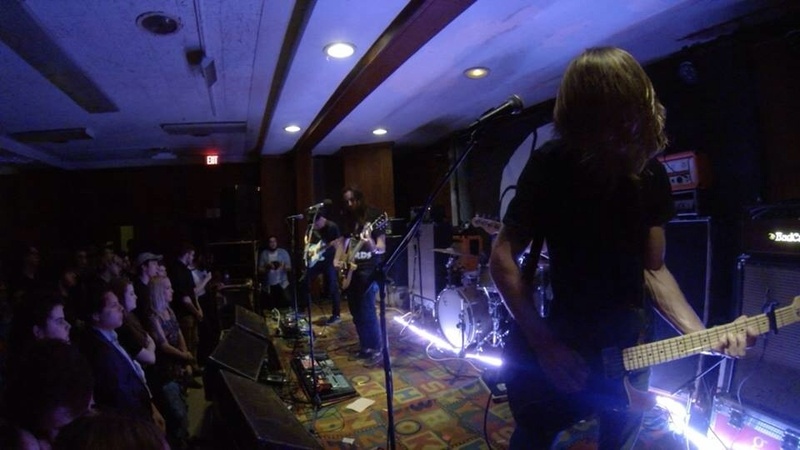 We began our full US tour with Pianos Become the Teeth and Loma Prieta at the First Unitarian Church in Philly. The show was amazing and we couldn't ask for a better way to kick off this tour. It was an honor to finally play such a legendary spot for shows and we certainly hope to be back real soon! New Music Video for "Low"
Today we're debuting our new music video for "Low" right on our own site, bloomandbreathe.com. The video was created by our very own Mike Maroney, and was meant to mirror the album art theme. We'll be posting a process blog for this video in a few days outlining how it was made, so stay tuned! The album comes out tomorrow, and be sure to come say hi at one of our upcoming shows! Our dates with Pianos Become The Teeth are selling quickly! We're excited to unveil a new track, "Low," off of Bloom & Breathe today over at Rock Sound! We hope you all enjoy! Bloom & Breathe is out October 21st! Music Video for "Not My Blood"
A few months ago we ventured off to an abandoned church in Gary, Indiana along with the Audiotree crew to film a new music video. We're happy to share that video with you all today.